Compassion Holds | Modified k9 Inc.
What is a “Compassion Hold”? Compassion Hold simply put. . . It is a humane act that ensures the last days of a suffering or elder dog’s life with safety, love & comfort. No dog should spend their last days in pain and alone. This is why we need YOU to become a Compassion Hold Home/Family. Unfortunately, many shelters still see sick or elder dogs as an opportunity to open up kennel space (via euthanasia) for younger dogs entering the system. If you would like to become a temporary foster home for one of these deserving dogs in need of some extra love and attention, please email us at: modifiedk9@hotmail.com for more details on how to become part of our program. We are looking forward to working with you for these dogs! all her life due to reoccurring cancer. While in her compassion hold home she was loved, comforted and pampered very much by her foster mom Sarah & family. 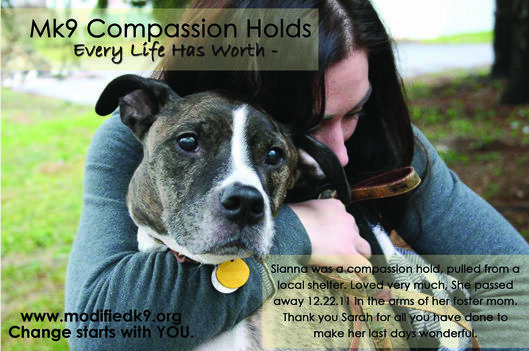 Sianne passed away 12.22.11 in the arms of her mom Sarah. Sianne spent her last days living life to the fullest and with people that adored her beyond what words could express. Thank you Sarah, for opening your home and expanding your heart to such a lovely, deserving soul. All that you have done for her while she was in your care is an outstanding act of compassion! Please, consider taking on a life that needs you now more then ever. "Realize deeply that the present moment is all you ever have. Make the NOW the primary focus of your life."